Housing services for youth are in high demand throughout the city of Chicago. More specifically, housing services for the LGBTQ (Lesbian, Gay, Bisexual, Transgendered, and Questioning) community is particularly sparse; it leaves many young adults without shelter for days at a time. “It is really difficult to see these young adults being kicked out of their homes,” said Cassandra Azenatti from Vida/SIDA organization. “We see children as young as 12 years-old and 13 year-olds trying to fend for themselves. They are not psychologically prepared to really go out and support themselves.” Vida/SIDA, an organization under the Puerto Rican Cultural Center, will soon change that when they open their doors in March to the new independent living program for homeless LGBTQ and HIV-positive youth, called ‘El Rescate.’ “Our best source of outreach is young people who are coming into the space liking it, recognizing that it feels safe, that it feels like home, and really providing a reputation as being affirmative,” said Azenatti. ‘El Rescate’ will provide ‘culturally appropriate, identity-affirming housing’ for eight to ten currently homeless young adults ages 18-24. The program will also provide residents with prevention case management, employment and educational resources. “This is a unique program, one that we are really excited about,” said Director of Vida/SIDA Juan Calderon. “There are very few housing services that really provide the needs for this community and we really hope to expand in the next years.” During a phone interview, Azenatti shared the importance ‘El Rescate’ setting the trend and why more people should be paying attention to this issue. 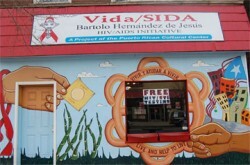 VIDA/SIDA has been working on getting the housing program started long before I arrived. It’s been about two years. They came up with the idea because they recognized an incredible need for helping homeless youth, more specifically the LGBTQ (Lesbian, Gay, Bisexual, Transgendered, and Questioning) community. So it took a long time in terms of getting zoning and resources, you know things of that nature. It’s been in the works for a long time and it’s finally come to fruition. It’s opening on March 3. There is a fairly limited amount of space, but as the City goes, there are really no LGBTQ specific housing beds available for those homeless youth. So many youth get turned away due to space issues. So this is a really unique service, one that fits a dire need. Everyone is really excited to finally see it open and see things get underway and hopefully expand. We already have our sights set on future projects to be able to house a lot more young people. Housing programs, like ‘El Rescate,’ is important because there are so few of them that are affirming for these young people. We see young adults who are already facing homelessness and probably a lot of institutional and interpersonal violence. Add on the additional layer of being bisexual or gender minority, you experience a lot of discrimination. A lot of, like I said, institutional violence from some agencies that are meant to help you. And then for folks who are gender non-conforming you have services like, shelters or housing programs that may not honor that person’s gender-identity and may force them to actually stay, live, or speak with a gender that they don’t identify with. Because there are so few of these spaces, it’s really important to create and sustain them where young people can come and be affirmed of who they inherently are as people. Have their gender respected, their sexuality respected, just their basic humanity affirmed and encouraged is really important here in the community. It is definitely heartbreaking to see these young kids being kicked out of their home. They just suffer a great deal of trauma. But for me, knowing they are here and knowing the time that we spend with them….they are going to be embraced and honored for who they are, it does make me feel motivated to feel energized to keep providing the services to reach out. Through our work we want to convey the message that you are a beautiful and valuable person. And there are places for you where you can grow and achieve what you want in your life regardless of what you may have been told by family and peers. I hope it represents an awakening and realization that this is an issue that we need to deal with immediately. I hope it’s going to be part of a trend, the increase of services for this group of people, particularly housing services. And I hope that in the Humboldt Park community it continues to challenge ideas of homophobia and trans-phobia. I haven’t experienced a lot of bigotry or hatefulness, but some level of ignorance. My hope that with increased exposure comes increased acceptance, the City will start to take note that these services are incredibly necessary.